When you first start your life on your new farm, you will have five Cherry Trees pre-planted on your beginning crop field. You can choose to chop them down with your axe to make room for other crops, or leave them be so they produce Cherries in the Summer. Trees, in general, are a stable crop; they don't require any watering and appear to be impervious to storm damage. The disadvantage to trees is the amount of room the require. Each tree needs to have 1 square of empty space surrounding its trunk, which equals a 3x3 square with the tree growing in the middle. You can fit 15 trees in the beginning crop field, but that leaves little room for any other crops you may need to grow. Tree saplings can be purchased from Marimba Farm. As the seed shop expands, more trees seedlings will be available to buy. Each type of mature flowering tree will produce 2 pieces of fruit every day in the season that it is suppose to produce fruit in. To collect the fruit, you will have to press against the tree's trunk until it bends a little bit and drops its fruit. 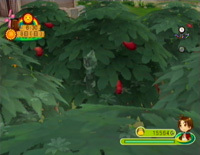 If there are too many weeds growing in the 3x3 square the tree occupies, and there isn't a clear spot for the fruit to land, the tree won't drop anything. You will have to clear out the weeds before you can receive fruit. A tree that is almost full grown will simply produce 1 fruit per day. The quality level of the fruit is not relevant to the soil quality the tree is planted in. If you plant a tree in high level soil, it only makes the tree mature faster. For example, an Apple Tree planted in level 1 soil will take 30 days to mature, but the same tree planted in level 5 soil will only take 10 days. The minor inconvenience of trees is the amount of foliage they have. 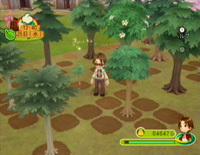 If you do grow a large amount of trees in a single area, it becomes difficult to see your character in among all of the branches because of the camera angle, as well as trying to locate the back-tree's trunks in order to collect the fruit. It may be a good idea to just plant trees around the outside borders of your crop field so you have a clear view. Trees will go dormant when you are not in the producing season. They stay around forever until you chop them down with your axe. There is one tree that does not produce any fruit at all. The Evergreen tree can be grown on your farm for the purpose of lumber. It may seem like a good idea, but with an unlimited amount of lumber available in Fugue Forest, the 3x3 space an Evergreen tree takes up is better used for crops that actually give you profit. The Grape is not produced from a tree. You can buy Grape Seeds from Marimba when the shop reaches level 2, and grow Grapes during the Fall season as a normal 1-square space crop.